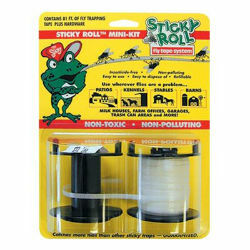 Non-Polluting, non-toxic Sticky Roll™ is a reel-to-reel system of sticky tape that really catches flies! When flies first hatch, after feeding, or when the weather cools, they tend to congregate overhead, where they are caught on the roll. Once entrapped, they produce stress chemicals which are irresistible attractants to other flies. Eventually the tape is completely black with trapped flies. USDA testing shows that Sticky Roll captured 92% of available flies, an astonishing performance. Sticky Roll™ is easy to install. For use in areas such as: dairy barns, horse stables, animal premises, veterinary areas, kennels, zoos, and anywhere flies are a problem. Mini-Kit comes complete with 81’ Sticky Roll™ tape, take-up reel, mounting brackets and screws, all in a handy blister pack.